qilo wins 2019 Raising Star & Premium Usability Award from FinancesOnline! We’re all incredibly proud of what we accomplished at qilo in the last 3 years, and our latest honor gives us even more reason to celebrate. qilo has earned the prestigious 2019 Raising Star and Premium Usability Award from FinancesOnline, a popular B2B software review platform. This recognition is given out annually to products that provide outstanding solutions for B2B companies across a number of categories. We’re delighted to have a shiny new award to put on the qilo mantle, but more importantly, the 2019 Raising Star and Premium Usability Award is another confirmation that at qilo we are committed to help CEO’s and companies drive execution on company strategic objectives and help them accelerate growth. Please visit FinancesOnline.com to post your own review of qilo, and thanks for your support through another amazing year. FinancesOnline recognized qilo with two industry awards in the top enterprise project management software space for its exceptional usability as well as its consistent market growth and customer reception. The review platform noted a highly positive user feedback through its Customer Satisfaction Algorithm, with Qilo garnering 141 positive social mentions and no negative social mentions at all. This allowed us to win the Rising Star award for 2019. Furthermore, the software experts found all available Qilo features to be quite user-friendly and intuitive, thus allowing us to be distinguished with the Premium Usability title. Keep visiting qilotech.com to check what’s in store for 2019! A design pattern is a general repeatable solution to a commonly occurring problem. 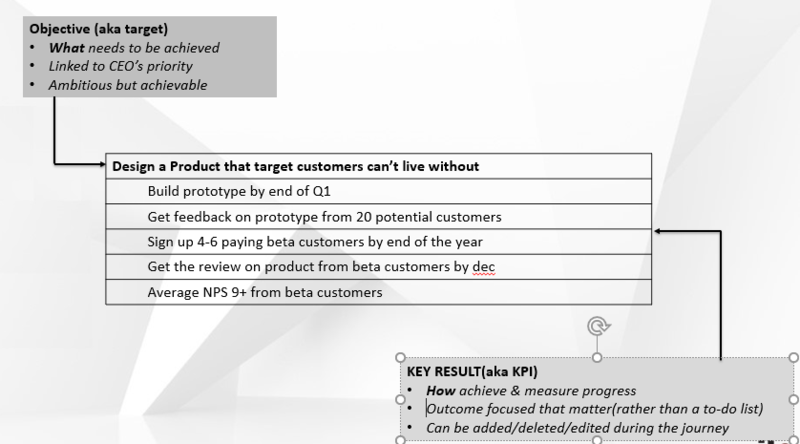 In the context of OKR (Objective & Key Results) many companies fail at the implementation stage as to how to arrange the OKR’s in a way that can lead to successful implementation and adoption of the framework. This challenge will come to you when you have understood the basics of OKR and probably have read a couple of books and articles on the subjective. When implementing the OKR in your company, you need to remember that the organization is not made of different parts and pieces but it’s a complex adaptive system. And this system is run by people who have different motives and need to be satisfied at gut, mind and heart level. Any change we bring into the system needs to be carefully thought through. 1. 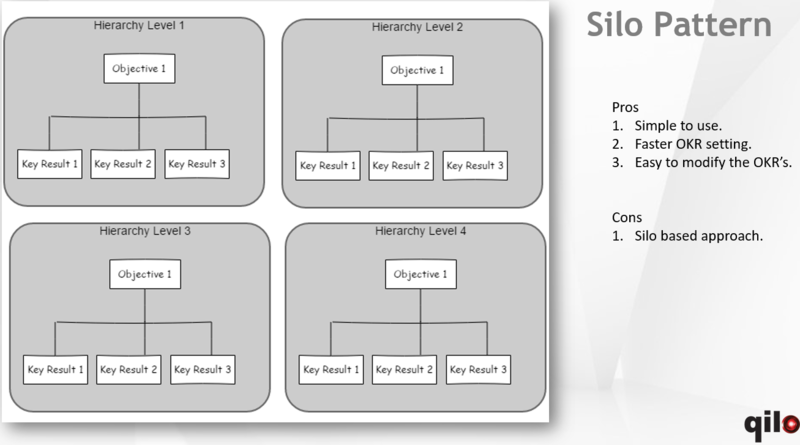 Silo Pattern: Each individual owns the objective and all the keys results are owned by the objective owner herself. Its simple to implement and easy to modify but again encourages silos in the company. 2. Team-Based OKR Pattern: Its different from silo pattern in a way that the Key Result are either owned by (a) objective owner reports(team members working under objective manager). Or the Key Result are owned by someone else working under a different manager, but working with the Objective owner to achieve that Objective. 3. 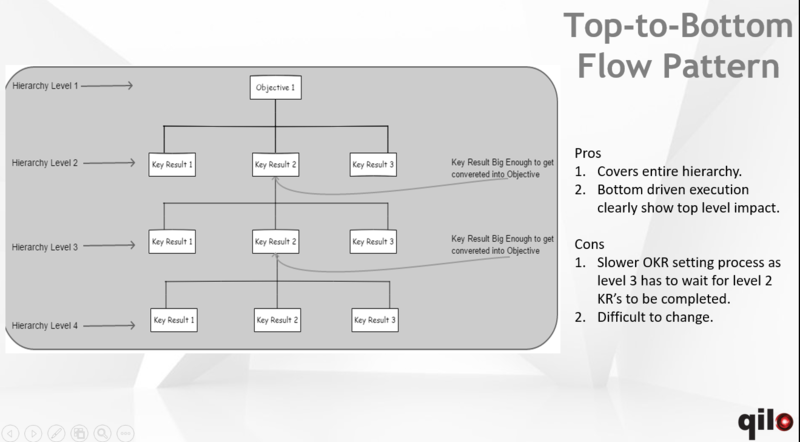 Top-to-bottom Cascade Pattern: In explaining this pattern (which means a way to arrange OKR’s) I am assuming that your company has 4 level hierarchy. 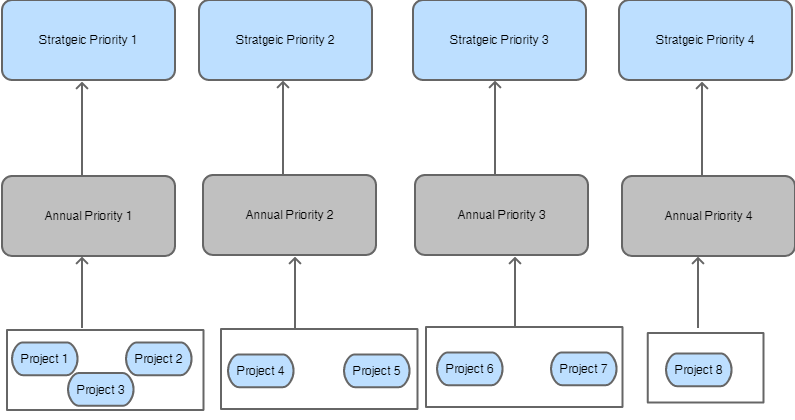 This OKR design pattern connects the top level execution agenda with the bottom level execution. 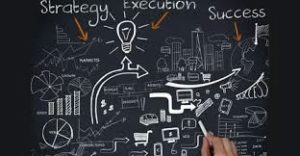 This means that the agenda of execution is cascaded down till the last mile of the company. But it also assumes that most of the execution is taken care by the bottom layer of the company. 4. 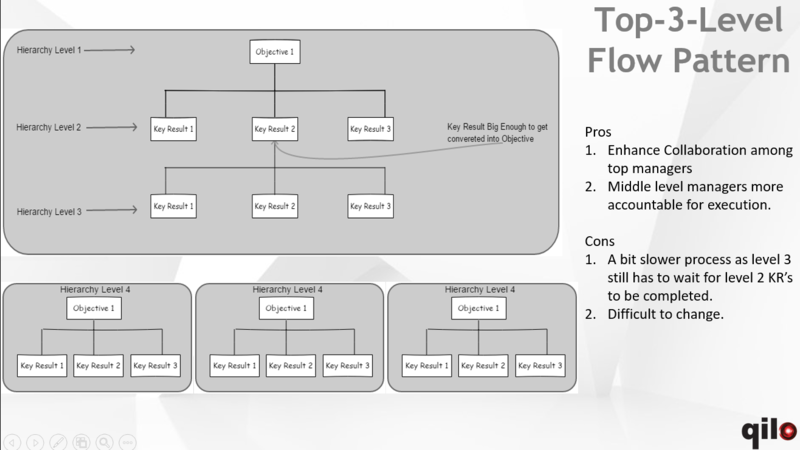 Top-3-level Cascade Pattern: Again assuming that your company has 4 level hierarchy. In this OKR pattern, we connect top 3 levels of the company and cascading stops at the 3rd level of the company. And the 4th level will have their OKR’s based on silo pattern. It is based on the understanding that if the top 3 levels of the company are in sync then we will have a better flow of the agenda. If your OKR cycle is quarterly, which means you create and close OKR’s every quarter, then you end up spending too much time going top-to-bottom. What if the cascaded OKR ownership needs to be changed? In 90 days, deciding your OKR’s and then cascading means you end up your entire time in cascading than execution. 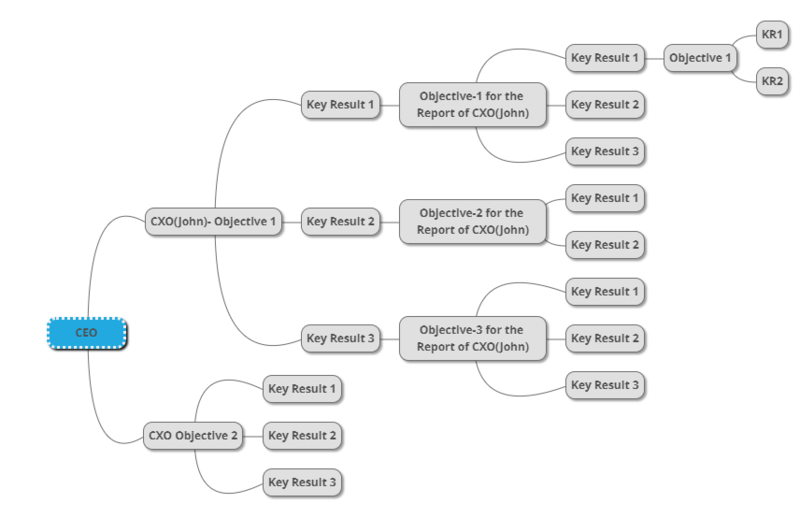 Cascading means CXO’s and Managers are not owning any Key Result, which means they are not executing anything. But that’s not true in the real world and should not be true. If that’s what you want to implement, then you are again promoting hierarchy in your company. Deciding which Key Result to cascade and which to not is not always clear. We at qilo, have learned it in a hard way after many implementations. Clients want Cascading, and we have given them what they want. But at the end, any OKR Software success depends on the OKR implementation and adoption by the people who will execute those OKR’s. A. Aligning OKR’s with CEO’s Annual Operating Plan or Strategic Initiatives. This approach is bi-directional and works wonderfully. It gives clarity to CEO and his team that as an organization, where we are going, and how we are doing. 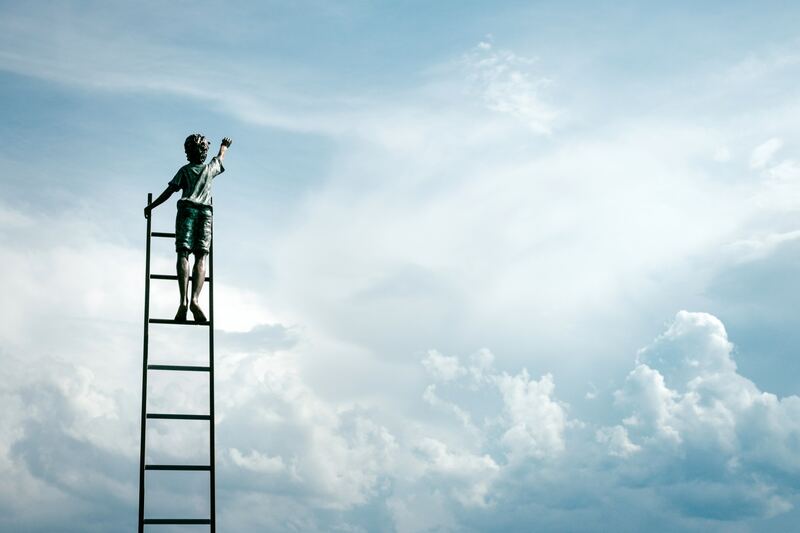 And for an employee working below the CXO level, it gives them clarity of how they are connected with the big picture. The only trick here is to successfully come up with the set of 3 to 5 business priority statements that don’t overlap and clearly linked with what company wants to achieve in that financial year. B. Creating Team-based OKR’s: Rather than cascading, create the team-based OKR’s where Key Results are owned by multiple people. These KR’s go beyond the hierarchies and departments. The concept is bit more difficult to digest at first, as managers want to hold their boundaries and don’t want people coming from different teams and hierarchy coming directly to their OKR’s. But it beautifully solves the problem of cross-functional communications and collaborations. Mind you, this needs a bit of change management to occur.CEO and/or COO himself has to take the ownership of communicating why we are doing this. Cascading OKR’s results in wasting too much time setting OKR’s. For successful implementation, Align OKR’s with company’s Annual Operating Priorities or Long-term Strategic Priorities. Creating a team-based OKR’s aligned with the company’s priorities results in better team communication and collaboration.